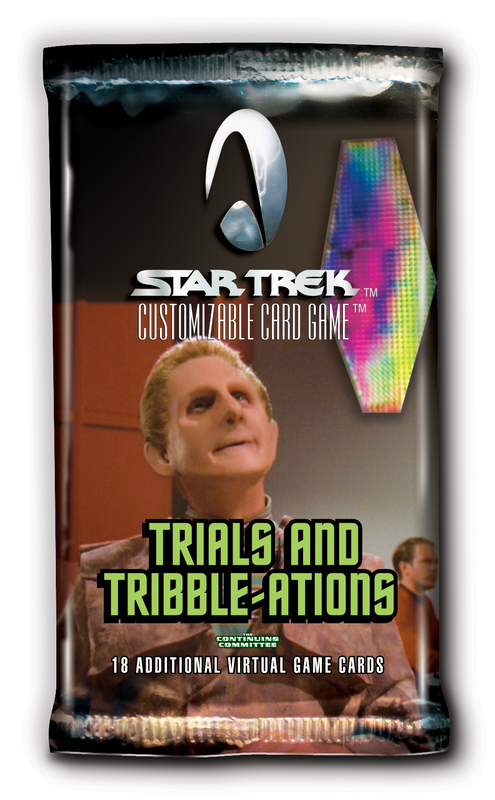 A Virtual Expansion released on 2016-09-30, containing 18 new Tribbles cards. The Ferengi have acquired Tribbles and are spreading them throughout the galaxy! Following the Rules of Acquisition, the Ferengi are peddling Tribbles, indifferent to their ecological menace! Even more troubling, Tribbles have spread through the Guardian of Forever and are infesting some of Star Trek's most iconic moments! Ferengi profits might be up, but who's going to deal with all of these Tribbles? 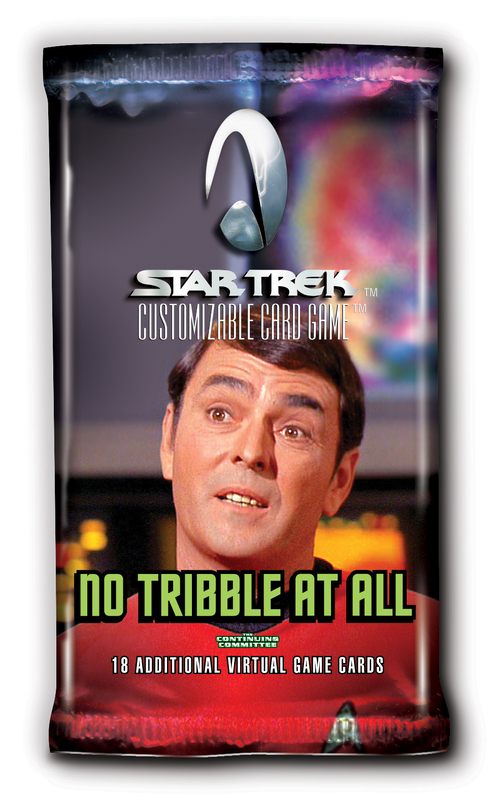 A Virtual Expansion released on 2015-07-24, containing 27 new Tribbles cards. It's hard to make an honest credit in the galaxy, and it's even harder now that Tribbles Royale, the sixth virtual Tribbles expansion is here. It's time to Ante up, Roll the dice, or play a few rounds of Dabo. 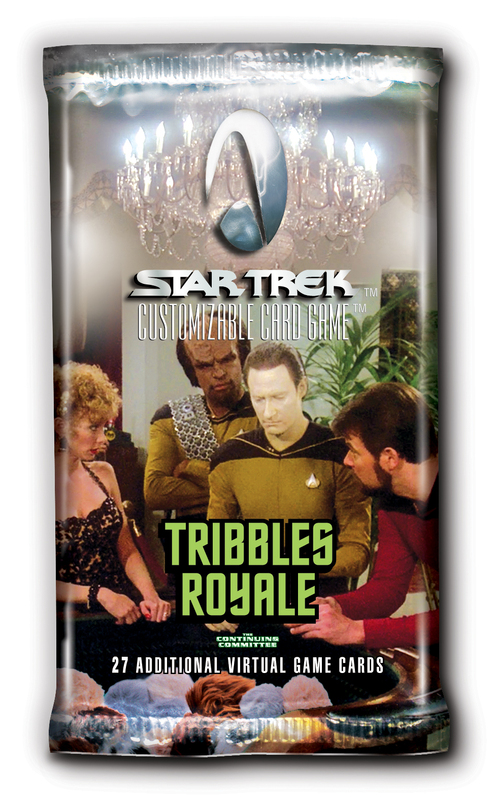 Beware Tribbles and Troubles as you explore Tribbles Royale. 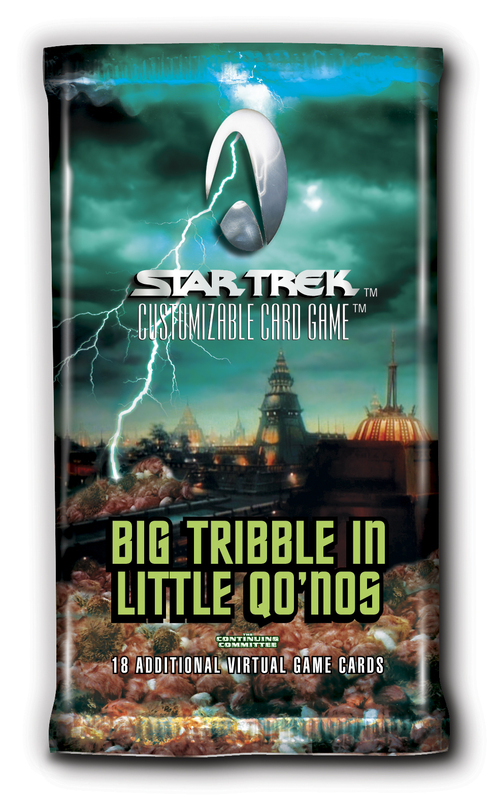 A Virtual Expansion released on 2013-04-02, containing 18 new Tribbles cards. 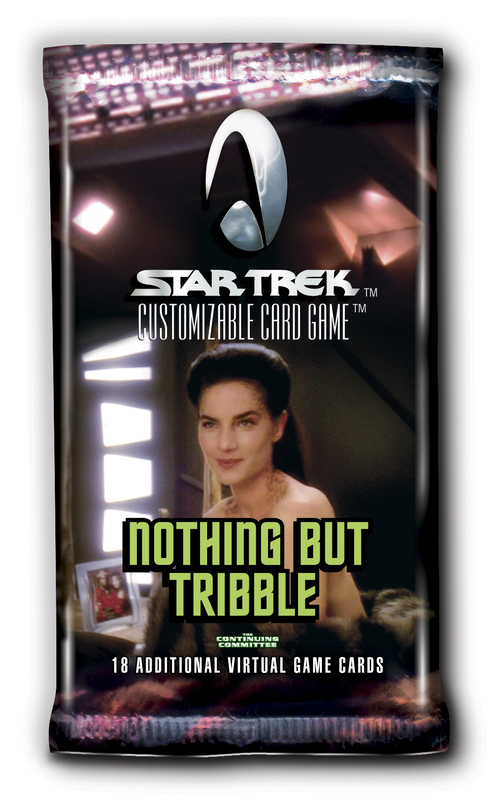 A Virtual Expansion released on 2012-04-01, containing 18 new Tribbles cards. A Virtual Expansion released on 2011-04-01, containing 18 new Tribbles cards. 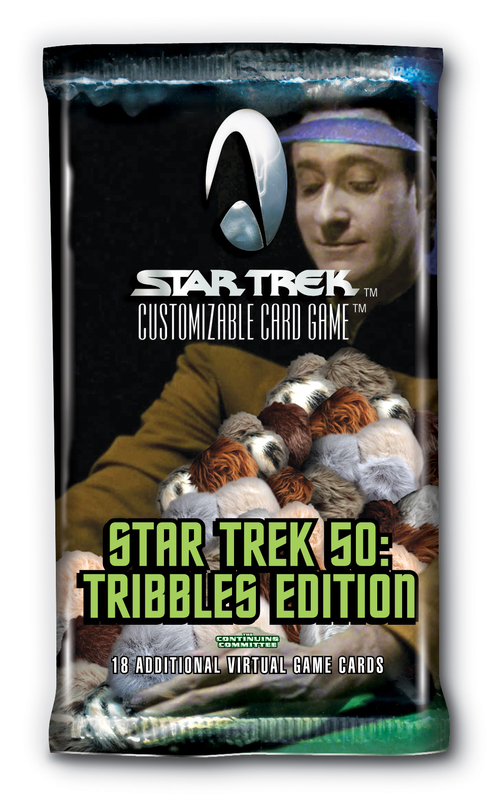 A Virtual Expansion released on 2011-02-24, containing 43 new Tribbles cards. A Virtual Expansion released on 2010-04-01, containing 18 new Tribbles cards. A Virtual Expansion released on 2009-04-01, containing 18 new Tribbles cards. A Physical Expansion released on 2000-10-18, containing 1 new Tribbles cards. Reflections: The First Five Year Mission is well-named. Each Reflections pack gives you 17 randomly assorted cards from Premiere through The Dominion sets plus an 18th card, a foil version of a classic Star Trek CCG rare. Reflections introduces "topper" cards. Four of these premium foil cards will randomly appear, one per display, on top of the packs inside the 30-pack display box. They are normal-sized, playable foil cards... four of the best-looking and most desirable cards we have ever made! There are 4 ultra-rare foils, 50 super rare foils, and 46 very rare foils, resulting in a 100-card set size. A Physical Expansion released on 2000-08-09, containing 18 new Tribbles cards. 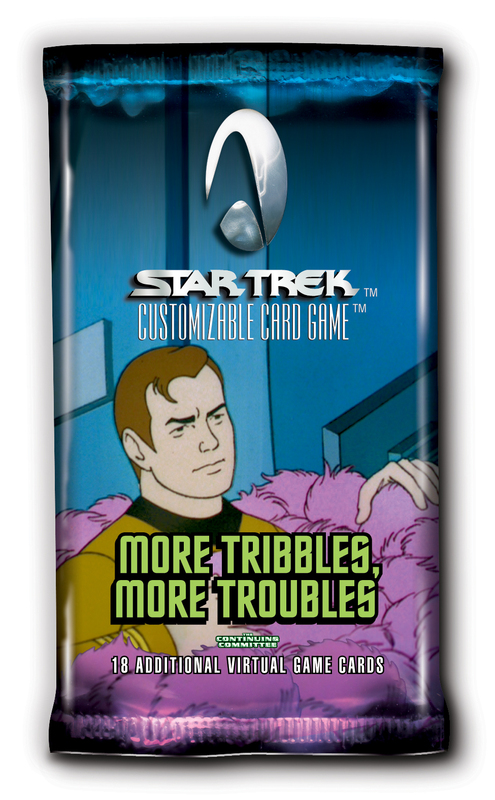 The Trouble With Tribbles expansion set includes 141-card set and the special "game within the game." Get set for Tribbles by previewing the card images and reading some exciting articles from Star Trek CCG's most respected authorities, contests and more. A Physical Expansion released on 2000-06-30, containing 57 new Tribbles cards.